We have an incredible line-up of homes and properties for this year’s tour! The Duluth Preservation Alliance (DPA), which advocates for the preservation of Duluth’s historic architecture, is hosting its 38th Annual Historic Properties Tour on Sunday, September 16th. The tour, which is self-guided and set at your own order and pace, is the DPA’s premiere fundraising event each year. Attendees always learn interesting information about the properties, their architecture, and their history. It’s a fun event for those who love a peek into our past. Tickets are $20 per person and can be purchased online (preferred) or in the Fitger’s lobby on the day of the event (10:00 am to 1:00 pm). Note that children are free with a paid adult ticket. You may tour in any order you wish. Please remember that these are private properties and respect the guidelines the individual owners have set out for the tour. For more information about tickets or the event itself, please contact Dennis Lamkin via email or by phone at 218-349-0973. 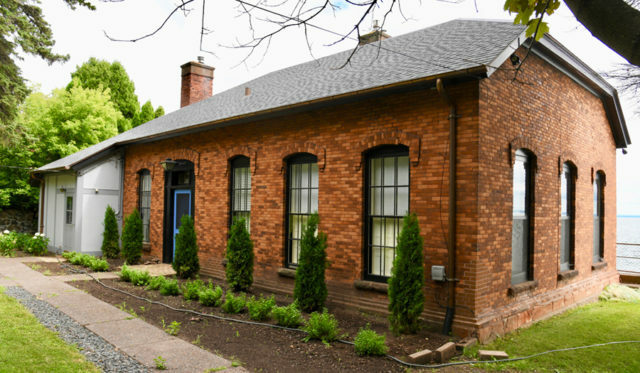 This home was originally designed by John Wangenstein in 1860 as the water intake pump house for the City of Duluth but was abandoned when the new pump house was built on Scenic Highway 61 in 1897. The building sat vacant until Miss Elisabeth Congdon purchased it and engaged local architect Harold Starin to convert this once industrial building into an absolutely gorgeous jewel box of a home in the French style. Large windows were installed facing both the courtyard and London Road and a terrace was added which overhangs the lake. French doors frame the large living room and its commanding view of Lake Superior and the Aerial Lift Bridge. The house is so close to the lake that the storm shutters are drawn over the windows and the back of the house gets wet with lake spray during storms. A 6 foot foundation and a wave deflecting system are in place to protect the house. NOTE: Significant stair climbing. 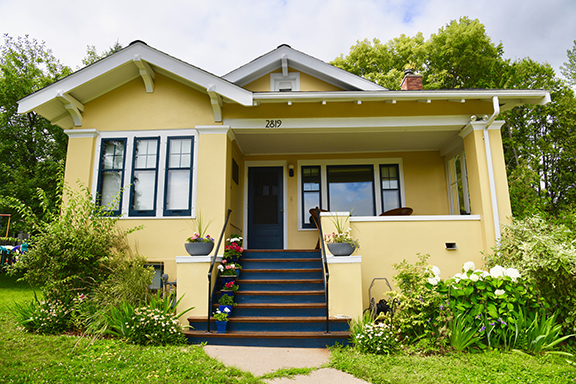 This Craftsman style house was built in 1918 and is described as a “California Bungalow” as it has no halls and many built-ins. The original architect is not known. An addition designed by architect and owner Hugh Reitan was added in 2000 along with remodeling which included replacing the hutch to its original location and the missing wall between the living room and dining room with a cased opening. Originally the basement had a tuck under garage which is now a family room. The west side room was two rooms when built, one of which was a sunroom. The gardens are also available to view. 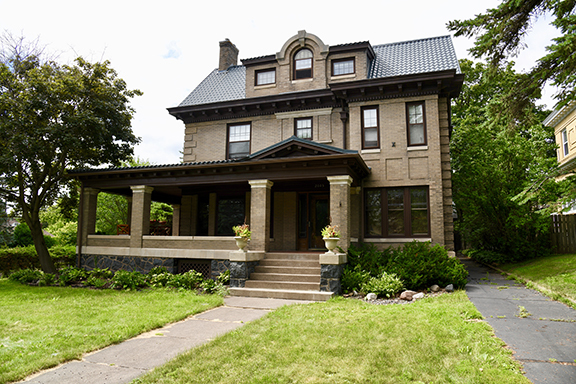 An eclectic mix of Flemish gables and Craftsman-inspired interior built in 1909, 2605 E 3rd Street is an example of Duluth’s heritage. The home was designed by Frederick G. German. The home’s first owner, Henry Fee, was a general contractor who hand-selected the fine woods featured throughout the home. He previously built a very similar home at 2305 East Third Street in 1906, but later refined the design when building this home. 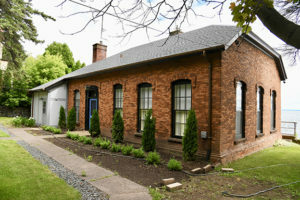 In 2015, new owners purchased the home, with goals to make historically sensitive updates while retaining its unique spirit. Recent renovations include a downstairs powder room, kitchen, lighting and wall coverings throughout. Built in 1903, the McCord’s two-story Shingle Style four-square house features a stone foundation, shingle wall cladding, and a spectacular front façade symmetrically arranged around a central two-story entry tower with a bell-shaped roof and a large T-shaped window with twenty-three diamond-paned lights on its second floor. The house was built by Berquist Brothers Construction, but the architect is unknown. The matching garage was added in 1912. Historic information on original owner Warren McCord is conflicting: some called him a lumberman; others, a banker. The current owner’s worked extensively on the home, including foundation work, to return this historic gem to a functioning home. Originally part of an opera house and later a vaudeville stage, this building was reconfigured into a glorious art deco style movie theater in 1940 with a notable tower marquee. 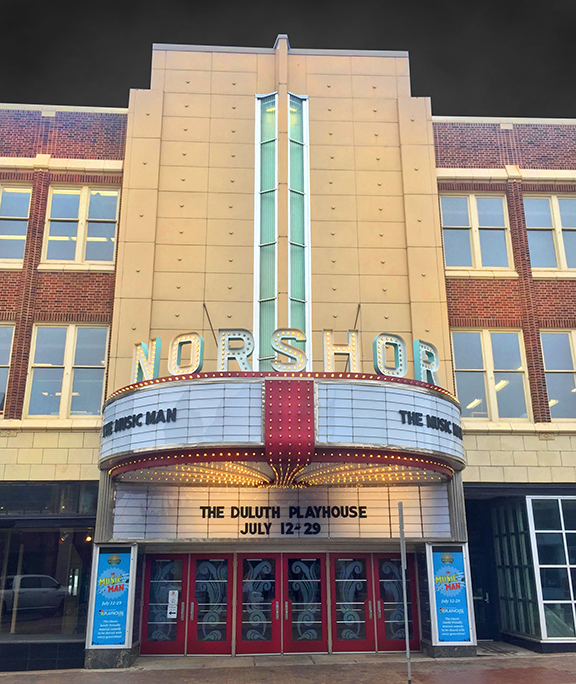 After 31 million dollars and a year and half of construction, the NorShor became the home to the Duluth Playhouse in 2017. The Playhouse produces 6 theater productions per year, shows vintage movies and hosts concerts and events. Major renovations included the installation of an orchestra pit and new seating, stage reconstruction and mural and balcony restoration. 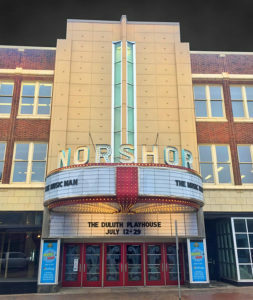 The building’s marquee, sans tower, was also restored to light up downtown Superior Street nightly adding ambience and life to the arts district. NOTE: Significant stair climbing, especially to get to the backstage areas. Thank you to our 2018 Historic Properties Tour Sponsors!